Offer irresistible caramel flavor in your coffee beverages with this Big Train caramel latte blended ice coffee mix! With a name symbolizing strength and constant motion, Big Train has expanded into a global foodservice brand you can trust with a large number of diverse products to choose from. Big Train has become a leader in the specialty beverage mix industry, delivering easy-to-make and consistently-delicious products. This creamy latte-flavored drink mix includes sugary sweet caramel taste blended with smooth Arabica coffee. Give your customers an energizing caffeine boost with signature coffee drinks that can be served hot, over ice, or blended! Easy to make, this mix can be used as a base to create your own flavorful lattes. Create cool frappes and add whipped cream and a drizzle of chocolate or caramel flavoring syrup! Featuring a rich, invigorating taste your patrons are sure to enjoy, this drink mix is gluten free, trans fat free, and contains no hydrogenated oil. This blended ice coffee mix is perfect for sprucing up the menu in your coffee shop or cafe in order to offer profitable, decadent drinks. It adds alluring flavor to your signature drinks, while satisfying your patrons' cravings for something sweet and new! For a 16 fl. oz. (480 mL) blended drink, add 5 fl. oz. chilled coffee, water, or milk to blender. Add 2 scoops drink mix and 1 1/2 cups ice. Blend until smooth. This frappe mix is one of my best sellers, its great with adding a double shot of espresso also! put a little whipped cream and caramel on top! Out of all the Big Train latte blended ice coffee mixes this one is my favorite. I am being a little biased because I really love caramel flavored things. This flavor was the first to be sold out! I'm doing a repurchase right now. i myself have tried it and it tastes amazing both hot and cold. We opened our shop 3 years ago and this flavor is the most sold in all of our history. A favorite among the young and the old it's a great balance of coffee and sweet caramel flavors. The Big Train caramel latte is sweet and creamy and has a great, strong caramel taste. A nice coffee flavor and a great balance of flavors. Perfect for our bakery. This Carmel Latte Ice Coffee Mix is perfect for both frappes or hot drinks. It has just the right level of sweetness and the price is better than I have seen on other websites. I made a caramel frappe with the mix also adding one shot esspreso and 3oz of milk to a 20 oz size's amount worth of Ice. It was creamy and delicious. The caramel flavor was very faint. We found that we were adding quite a bit more powder than we normal would. We may be trying the caramel cream next and hope to get a stronger flavor, but ultimately we were able to use this product with some other big train products and it still went over pretty well. This mix is just what every coffee shop needs to thicken up their caramel frappes! However, the coffee flavor is not very strong, so it works better as a flavor base rather than a coffee substitute.. 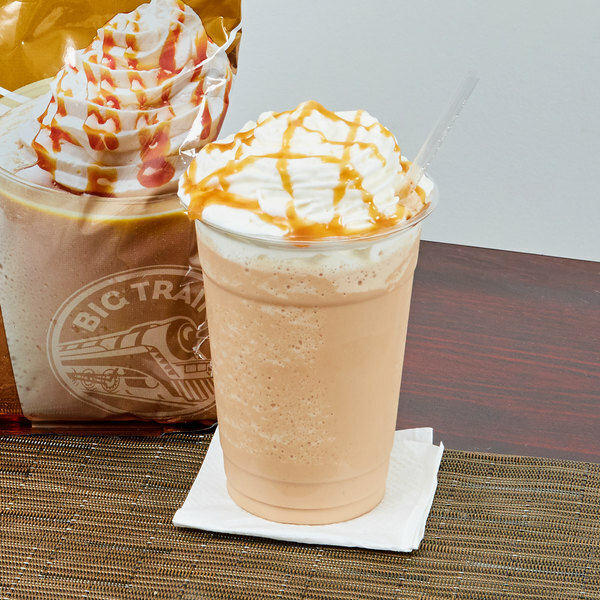 The Big Train caramel latte mix is a necessity for frappe flavors, it mixes well in a blender, and tastes amazing with whip cream and caramel drizzle on top. 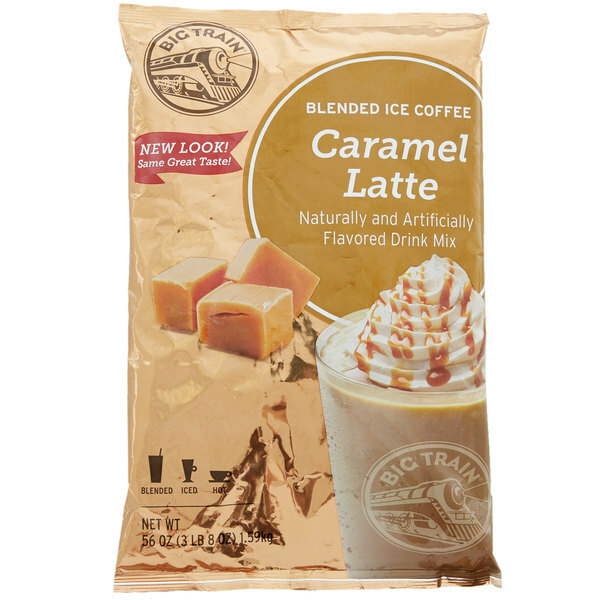 The Big Train caramel latte blended ice coffee mix is sweet and decadent. 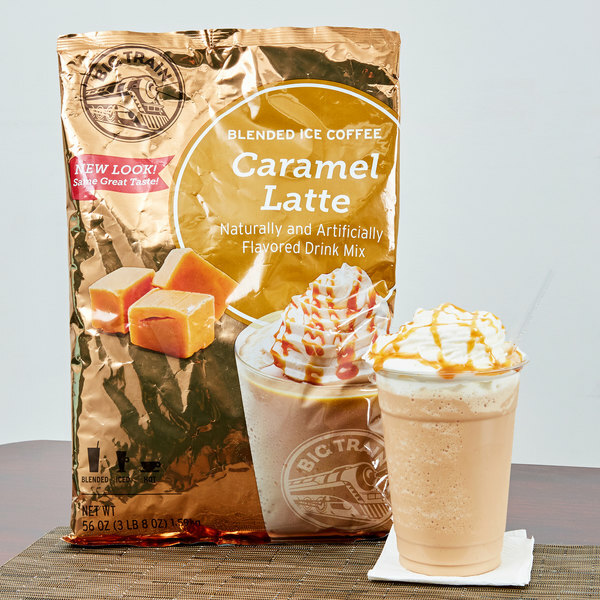 A rich caramel flavor and a great coffee mix that blends up quickly with ice for a great tasting coffee beverage. It's nice to offer people an alternative to just a regular ice coffee and nothing is more popular these days than caramel. This is a great selling product and tastes great. I am new found fan of Big Train mixes because they are flavorful and a great value. They always arrive packaged perfectly. The caramel latte ice coffee is sweet and creamy. It makes a wonderful frozen frappe and taste excellent. The Big Train Caramel Latte mix is amazing. It smells so good when you open the bag. We use the mix with water and ice to make blended drinks. We can make 40 drinks from one bag, which means a huge profit. We put whipped cream and a pump of caramel sauce on top for extra flavor. Caramel and coffee, how can you go wrong? Using the sugar free salted caramel flavor bought earlier and dessert is served! Tastes just like a fancy coffee shop without the big name price tag. Besides that it's always nice to know it's made at home. We have tried several Big Train brand flavors and LOVE them all. My family thinks this caramel latte is better than Starbucks and you can buy a 3.5lb bag for what 3 venti caramel frappes cost there. Great bargain!! Excellent Blend to Make Caramel Frappes. The mix is easy to measure and very refined. We highly recommend to our customers whom are buying Coffee / Espresso Units. A fast seller. This is a keep in stock item. The customers can't get enough of it. The price is also unbelievable. When I first began selling it it started off show and I am now out of it. I will order a lot more in the future. This is the most delicious frozen beverage ever!! Such a good seller for us. I would recommend it, especially if you have a younger customer base. ¡We really, really love this product! if you like sweet drinks, this product is indicated for you and this drink is as easy to make and of course it's delicious. The caramel smell is to die for, and that is nothing compared to the taste!! This caramel frappe is so good it's sinful! This is a must try for sure! Big Train is known for it's great coffee mixes. This Caramel Mix is perfect for a smooth sweet caffeinated drink. Definitely should be in everyone fridge. This product is amazing! The flavor is great whether you choose to add water, milk or cold coffee, either way it tastes great, I add a couple of shots of espresso and top it off with some whipped cream and caramel sauce, it's great! Nice product! It has a really strong Caramel flavor. make it hot or ice blend it both work perfect for me. Going to order some more later. Very good blended ice coffee mix. When blended with the rest of the ingredients like, the taste is very similar to a caramel frappe but not as sweet which was perfect for me. We add this to milk and ice and blend for a delicious frappe blended beverage. The customers love it! You can add a shot of espresso for an added kick! Love this stuff and love the profits! Several ways to make it...add water and ice, milk and ice, chilled coffee or frozen yogurt. Top with wipped cream and Carmel syrup and it is delish. Just mix it in the blender and serve. 40 servings per bag. Only complaint is that it doesn't come with a scoop so I had to search for the right size scoop. I have used big train mixes before but had to pay much more for them from coffee supple house. Very easy to use and mixes well.